Greetings! Today we bring you a dual look into Stellaris, a new 4X/Grand Strategy title from Paradox Interactive presented by Nehkara and Shiver Bathory. Stellaris is the most recent title from Paradox Interactive, who are well known for their grand strategy series such as Europa Universalis, Crusader Kings, and Hearts of Iron among others. 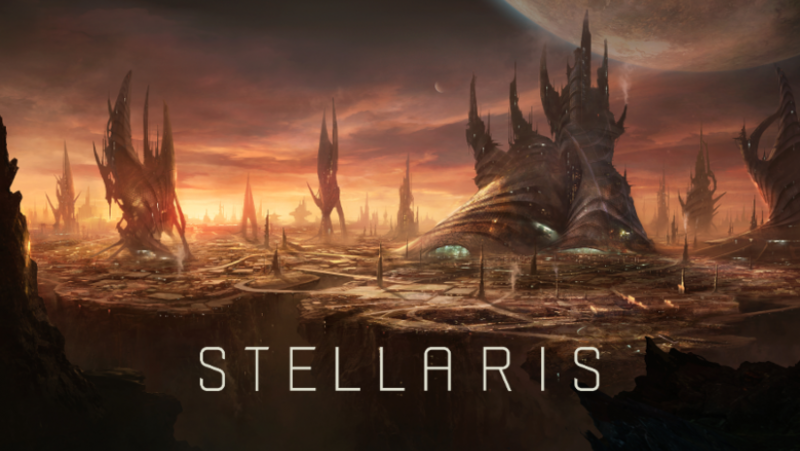 Stellaris is the studio’s first foray into 4X (eXplore, eXpand, eXploit, eXterminate) gaming which has, on the scale of strategy games, a somewhat faster pace than grand strategy. The result is an interesting fusion of the two genres. In Stellaris you start out as a fledgling spacefaring species who has just acquired FTL (faster than light) travel capability. Your species can be customized in many ways including appearance, ethics, traits, government, preferred planet type, and FTL method. At this point in the game you have very limited knowledge of the galaxy in which you live. You must send out your Scientists – commanding science ships – to explore the universe. They will research anomalies, discover habitable worlds, and uncover resources. Back at home you have Governors who you can assign to run your planets, Scientists who lead each of the three different paths of technology advancement (Physics, Society, Engineering), Admirals who lead your fleets, and Generals who lead your armies. There is a cap on the number of leaders you can have, so you will need to decide what areas are most important for you to focus on. Each leader has characteristics – they can also randomly gain or lose traits over time – and they age and eventually die. The early game is engaging in Stellaris. Lots of exploration, events, and tension as you try to build up your empire. When you discover an alien species during your explorations, you must undertake a research project to learn how to communicate with them before any further diplomatic options open with that species. The mid game lags somewhat – while it is still fun it can feel for periods of time as if not much is happening. I solved this by aggressively expanding, taking every opportunity to continue my explorations and vassalize nearby weaker empires. The late game in Stellaris is comprised of huge galactic events and massive wars where sprawling empires will duke it out for supremacy. About 20 hours into my main game, I suddenly had war declared upon me by an empire I had just discovered. Stunned, I assembled my defense but it was easily wiped out and I was defeated swiftly. I learned that this was a Fallen Empire. Put simply, while your empire may just be ascending into prominence – other empires have come before. Fallen Empires rose to prominence long before present, stagnated, and now just maintain their borders with no interest in outside species or expansion. This particular Fallen Empire was Militant Isolationist and therefore took great exception when my borders and science ships encroached on their territory. The empire responded by easily wiping out my fleets and starports and demanding I vacate 3 of my colonies close to their space. This was a harsh blow in the mid game – I was left uncomfortably vulnerable to attack. Thankfully I had already been able to eliminate most nearby threats and surround myself with allies and vassals. I had enough time to rebuild my fleets and find other avenues for expansion. When you lose a war like that, however, your empire is Humiliated which causes great unrest for decades afterwards. 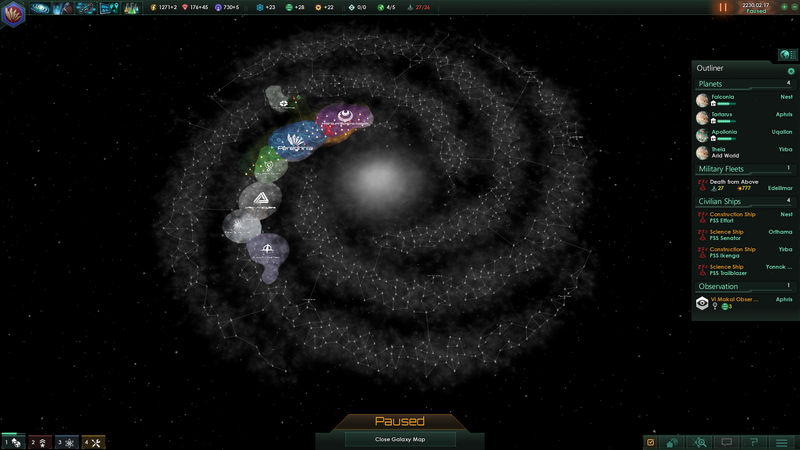 Stellaris plays very well. The pausable realtime gameplay with various speed settings allows for every player to be comfortable with the pace when they’re playing singleplayer, and to vary it throughout the game as the situation dictates. 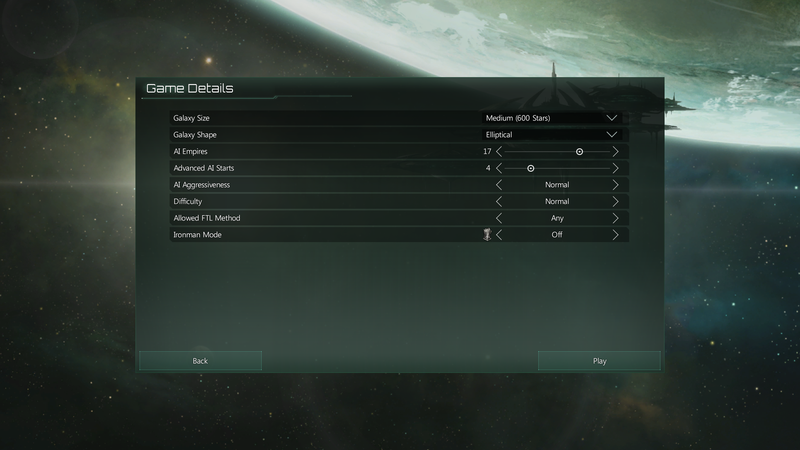 Each game is unique as alien races and events are randomly generated when starting a new game. The tech tree is not static either, as your path of research is a series of decisions between a randomized set of 3-5 techs each time. In addition, there are rare or unique technologies that may or may not show up for you in a playthrough. Some of these are generated from missions you undertake or decisions you make during anomalies or events. A few rather interesting features relate to primitive and pre-FTL species. Through researching the proper technology you can Uplift a primitive (non-sentient) species into becoming sentient and they will become another species within your empire. This can be useful to allow you to use this species to colonize planet types other than the ones within the habitable range of your main species – or to create a species of strong workers or soldiers. For pre-FTL species you will find them in various states of technological development. You are able to build an Observation Post around their planet and simply observe them (getting Society research), enlighten them (bring them into the space age), or covertly infiltrate their planet (annexes the planet). Adding to the replayability significantly are the different types of faster than light travel. There are three methods – warp, wormholes, and hyperlanes. Each plays quite differently and creates a unique experience. Warp allows your ships to visit any star system within a certain radius (which is upgradable). However, you must be at the edge of the star system to engage the drive and it takes some time. With wormhole FTL you must build wormhole stations to allow you generate these tunnels through space to take you to each of the star systems within range – this system allows you very long (and upgradable) reach but if your wormhole stations are destroyed it leaves you extremely vulnerable and with the potential for your fleet to be trapped. Hyperlanes is an attractive FTL method but can also get you into some sticky situations. Essentially each star system has specific connections to other star systems upon which your ships can travel. With this method your ships can jump from anywhere in a system, they don’t have to fly to the outskirts, and it’s fast. However, because these links are static you can find yourself in interesting situations where you have to go a very long route to get somewhere that the other FTL methods could reach with ease. Or the route can be cut off completely by a hostile empire. Heaping even more fuel to the replayability fire is the ship designer. You can outfit all of your various ships and defensive stations as you see fit, with a wide array of different weapons and defensive options. One game you might focus on speedy ships bristling with autocannons that have short range but potentially devastating effect if they can get in close. Another you might focus on torpedoes with extreme range and a complete disregard for shields, allowing you to pound on other fleets from a distance. Or you could borrow some technologies from various alien creatures and create ships that fire crystal shards or cloud lightning. Many options. Throughout the game, you need to closely manage two main resources. Those are Minerals and Energy Credits. Minerals are generated from mining stations both in space and on ground. Energy Credits from power stations, again both on ground or in space. Minerals are used for construction of buildings, ships, etc. Energy Credits serve as power and currency and are used to maintain everything in your empire. Large fleets even require Minerals for upkeep. Beyond these two main resources is a significant third resource which is Influence. This is mainly spent on diplomatic and administrative decisions and generated largely from your relations with other empires. For example, if you declare a nearby empire your rival, this will generate an amount of influence for you each month based on the strength and proximity of that empire but obviously your relations with the empire will suffer. Even further beyond that are strategic resources which are quite rare but can be used to fuel powerful buildings often giving empire-wide benefits. To minimize the amount of micromanagement as your empire grows, you can only manage 5 planets directly, although this number can be expanded somewhat through some technologies or government types. Once your empire grows beyond this size, you must create Sectors which you can then assign a governor and an overall focus. These foci are military, industrial (Minerals), science, and financial (Energy Credits). Finally, you can set a tax rate for the amount of their income that sectors will pay to you – this only applies to Minerals and Energy Credits as all science goes to you. I find this particular aspect of Stellaris to be very helpful because many 4X games become quite difficult to manage in the late game. The multiplayer in Stellaris I only briefly explored but it was quite enjoyable. The main contrast with singleplayer being that the dynamics of a human player are quite different from AI, and the speed of the game is controlled and set by the host. Multiplayer games can be saved and continued at a later date. 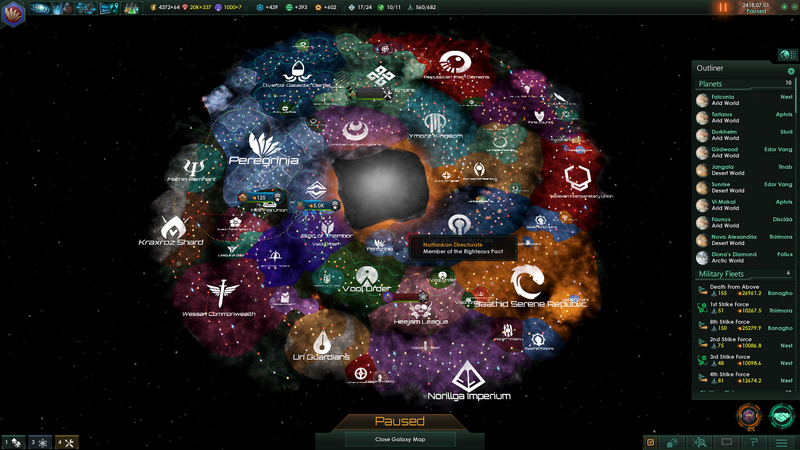 While playing Stellaris I encountered a number of bugs. None of them were game-breaking but some annoying. For example, not being able to change the admiral on one of my fleets, some errors in the text for events, quests not completing correctly. In addition, there are parts of the game that feel like a frame around which future content will be built in. There are some missing features from the game that can make it a little awkward in spots. For example, there are no map modes so actually seeing which empires are in which alliance/federation is quite difficult. In the same vein it’s difficult figuring out which empires you have embassies and rivalries with. 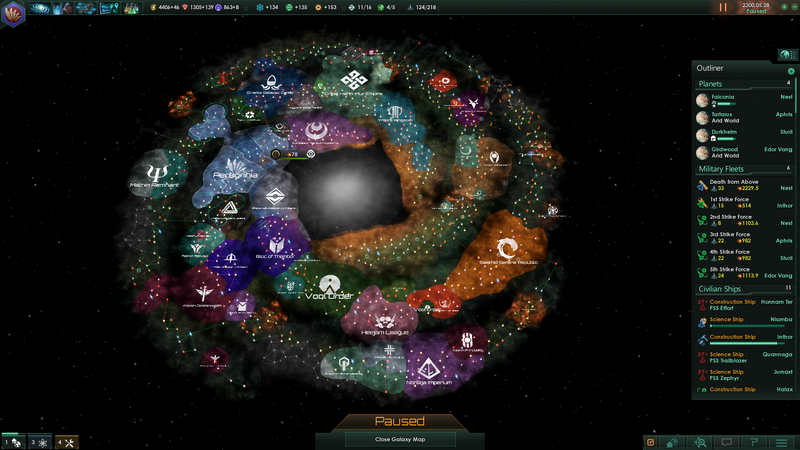 Paradox has already issued a couple of patches for Stellaris with a host of additional patches incoming throughout the summer, which they have outlined on their forums. These patches will contain not only fixes but additional content and significant gameplay changes. Beyond this, Paradox is famous for creating a vast amount of DLC for their games so expect a lot of content into the future. It remains to be seen if Paradox can deliver on its improvements and added content. 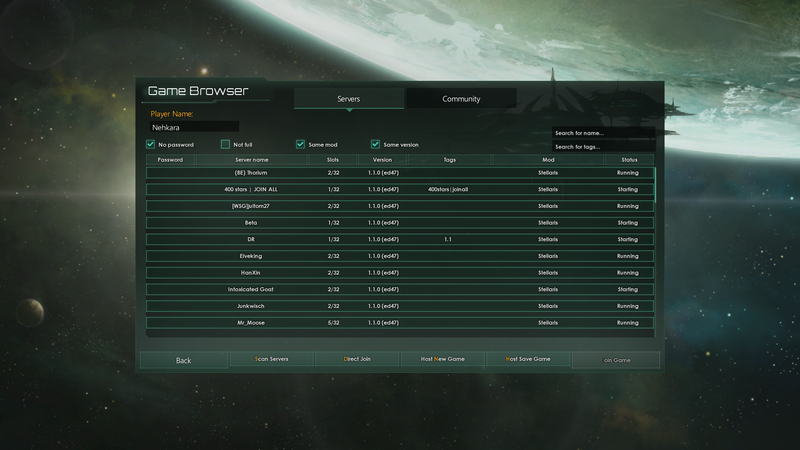 It should also be noted that Stellaris shipped with modding support built in. Via the Steam Workshop the modding community is already churning out content. In summary, Stellaris is a fun and engaging 4X/Grand Strategy title which has a lot to distinguish it from previous space strategy games while simultaneously not feeling wholly unfamiliar. It is a great base upon which Paradox and the modding community can build. The game does have some annoying bugs, missing features, and issues with slim mid game content add minor flaws into an otherwise great experience. 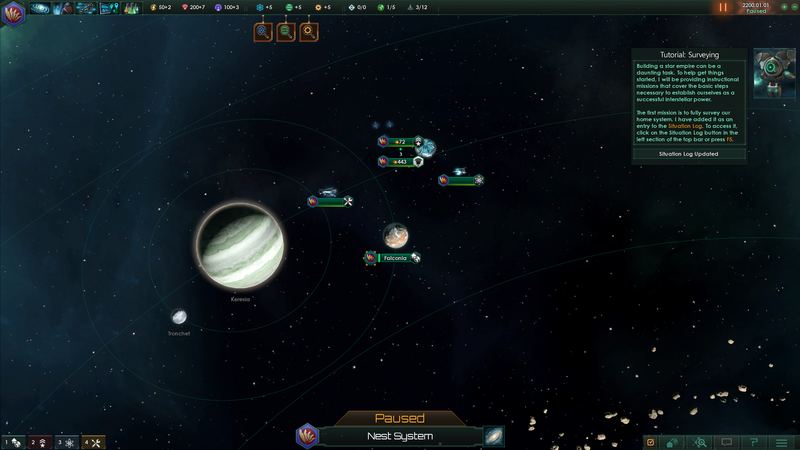 Stellaris has impressive replayability and is a game you could easily sink countless hours into. It also presents a fantastic value, with the base game being only $40 USD at launch – and already for sale for less in some places around the web. 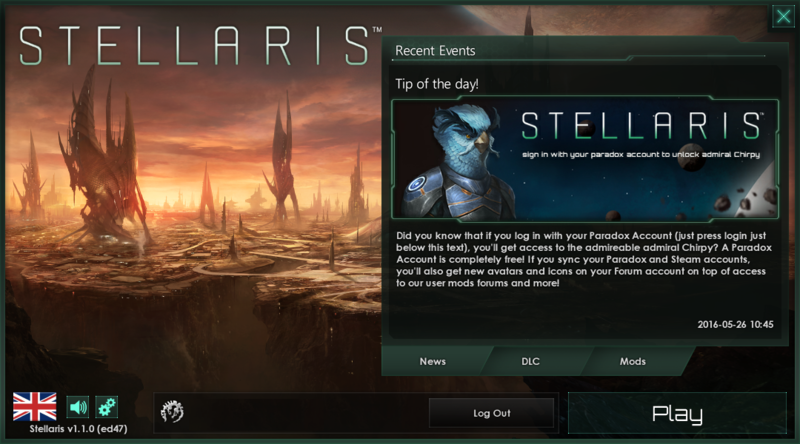 I went into Stellaris knowing very, very little. It was brought to my radar by Nehkara, I had a brief look at some of the Developer videos that had been released, only a few seconds, just enough to get a rough idea of what the game is. Going in I was unsure if this would be similar to Sins of Solar Empire or play more like Sword of the Stars II. As it turns out though, the game is entirely real time but feels like a hybrid of the two. Being a vast, sprawling, and slow burning Empire Builder, Stellaris doesn’t quite re-invent the genre but does offer a very unique, deep and immersive experience for the player. 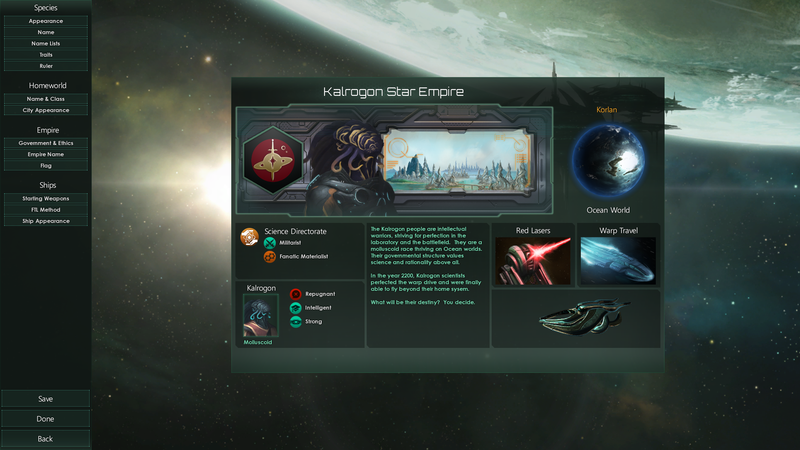 Stellaris provides the player an overall story arc and mission, which will vary depending on your playing race and its characteristics. This adds another layer of replayability as the story is quite compelling, perhaps not as engrossing for the typical RTS player as say, Sid Meier’s Alpha Centauri, but effective none the less. Along your journey to discovering the answer to life, the universe and everything, your exploring science vessels will uncover random anomalies. Many of these are simple one off events that you can choose to investigate for a one time reward or chance of failure. Among these events are also some emergent mission chains. Again these mission chains are based on your race and what you’ve encountered so far in your game. It’s things like that, that really add to the immersion factor in Stellaris. Being real time the Developers have used this to their advantage and added neutral, free roaming space based animals. It is interesting to note however, that while they have gone to great lengths in many regards to make the universe feel alive and breathing, some of the other smaller things haven’t been looked at. For instance although very minor, with all the detail in the universe, planets are static placements. This is most likely down to a tech reason to be quite honest and obviously doesn’t spoil the potential enjoyment of the game, but it’s one of those small things you think “That would have been nice to have”. Part of the slight ‘Sword of the Stars’ feel for me was the way that research worked. Rather than just having a static tree that you work your way through, Stellaris offers choices of tech for you to research in a particular field. The techs may not appear in the same order or even at all on your next playthrough with the same race, adding some weight to your decisions. The system feels a bit more dynamic as new things to research can appear from your exploration vessels finding a point of interest or from wreckage of enemy ships that your fleet destroyed giving the game an interesting and almost emergent feel. Combat is a fairly simple affair. You are able to decide the layout of your ships that you build into your fleet. Combat itself is real time but mostly it feels like it’s down to a simple numbers game of who has the most firepower wins. Ground combat involves you positioning your fleet in orbit of an enemy planet and deciding to bombard it from there. The kind of strike your fleet performs is decided on a small planetary screen and taken from your edicts list, while invading troops are built on one of your existing colonies and transported to the front lines via a troop transport and combat decided by whichever force is stronger. As a player you are given a wide range to customise and create your perfect race. With the ethics you decide as a base dictating the types of government available for you to select. Even when playing the game you may be able to research things that offer you new ways to add traits to your race. You are even able to change a fair amount of empire policies. Say you’ve discovered a large amount of primitive races on your empire’s borders and you want to assimilate them into your empire without using your military. You can build an observation post in orbit and if you’ve allowed it in your edicts, be able to accelerate the races evolution until they are your space faring vassal which you can then absorb into your empire a couple of decades later. Hey, I told you it was slow burning! One downside I found was that while there are many race options available, when it comes to making a new game to play the options are quite limited. Outside the usual scope of map size small – huge. By the way they are not kidding when they say huge! Number of races, and even an Ironman mode. There is currently no option to decide how many habitable planets there are, how many nebulas should be generated, and so on. I expect these options to be added at a later date but for now they are sadly just not there. There is also currently no form of espionage. Espionage is almost the stepchild of the genre, with fewer games including much beyond the same basic system we’ve had in place for a very long time now. Train or buy agent, send agent to enemy place, let agent do something, roll dice for success, failure, critical etc. Paradox haven’t included it, at least at release. With the amount of time they spent getting the game to feel right, I would imagine they are actually working on a system to implement that is hopefully a little bit more than just mostly a glorified dice roll, but time will tell on that. If you survive long enough, because Stellaris is fairly difficult even to some seasoned players out there, then you may find yourself longing for the events, and discoveries you were getting regularly fairly early on. As it stands now the mid-game is fairly light on the content compared to early and late stages, this will be addressed in future patches according to the devs. Future content is being talked about already and even as I write this, the first major (and free) content patch is in beta testing. Once more Steam Workshop is supported and really makes a lot of sense in a game like this, especially as Stellaris is very open for modders. The unique stories for each race, including ones you make yourself if you so wish, the way that research is semi randomised about what techs it gives you to research, the future content patches both free and paid for, and on top of that Steam Workshop integration all add up to make for a very rich and compelling game that you will want to keep coming back to play again and again. Currently there are some quality of life issues with multiplayer, not least of which is the often used workaround solution to play a game with a friend, but once you are connected the game runs well with little to no noticeable latency in multiplayer, and thankfully even offers save game support in multiplayer. 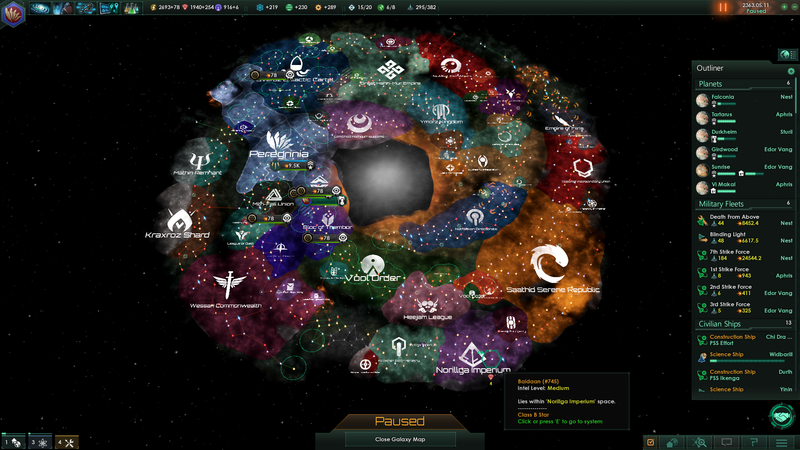 Stellaris is a really great game, that offers some interesting and fun to use mechanics, and although it is not a revolution to the genre it is a fantastic addition and offers fans of the genre some new things to play with as well as old staples, and those new to the genre a fun and quality introduction to the genre. We hope you found our impressions to be helpful!